Sakai Guides and DocumentationSakai Basics HomeWhat is Site Navigation? 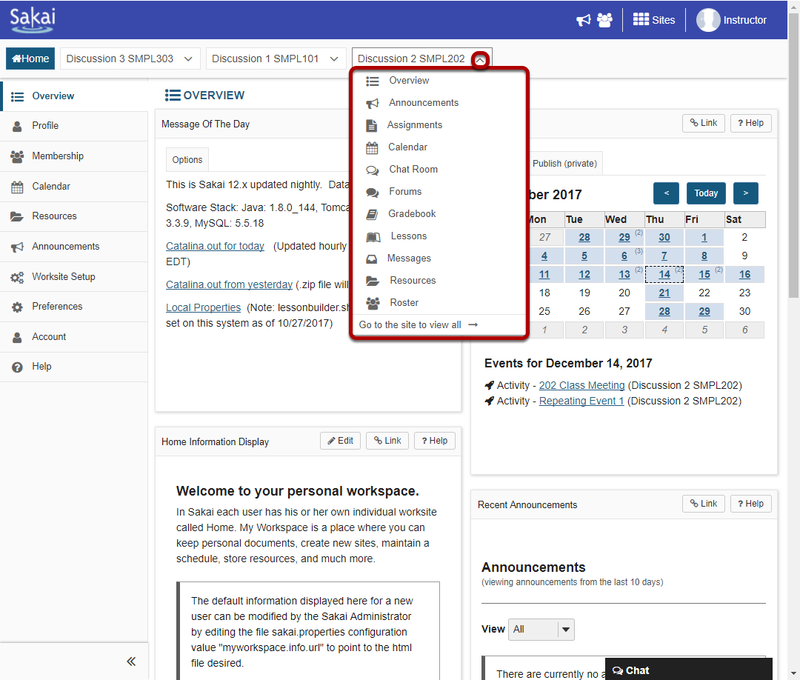 The Site Navigation across the top of the screen allows to you access all of the Sakai sites in which you are enrolled. You may also return to Home at any time by clicking on the Home button on the far left. Zoom: Jump to site tools. You may click on the down arrows next to each site name to expand the Tool Menu for that site. Selecting a tool from that list will take you directly to that area of the selected site. The currently selected site will appear highlighted in a different color in the navigation bar. The top site navigation bar can only display a small number of sites without appearing crowded or expanding to fill several lines. If you have many active sites, clicking on the Sites icon will display all of your actives sites. Sites are grouped by academic term and type of site (i.e. course or project sites). If you have the appropriate permissions, you may also create sites from this location. Note: Inactive or Archived sites will not display in the Sites drawer. You can access inactive sites from the Membership or Worksite Setup tools. Click on the star icon (Add to Favorites) next to a site in the list to make it a favorite. This will add it to your persistent navigation buttons at the top of the screen. Reload to view new navigation buttons. Zoom: Reload to view new navigation buttons. When you exit the Sites drawer, you will be prompted to Reload in order to view your newly selected favorites. All of your selected favorites will appear in the navigation bar. Zoom: All of your selected favorites will appear in the navigation bar. 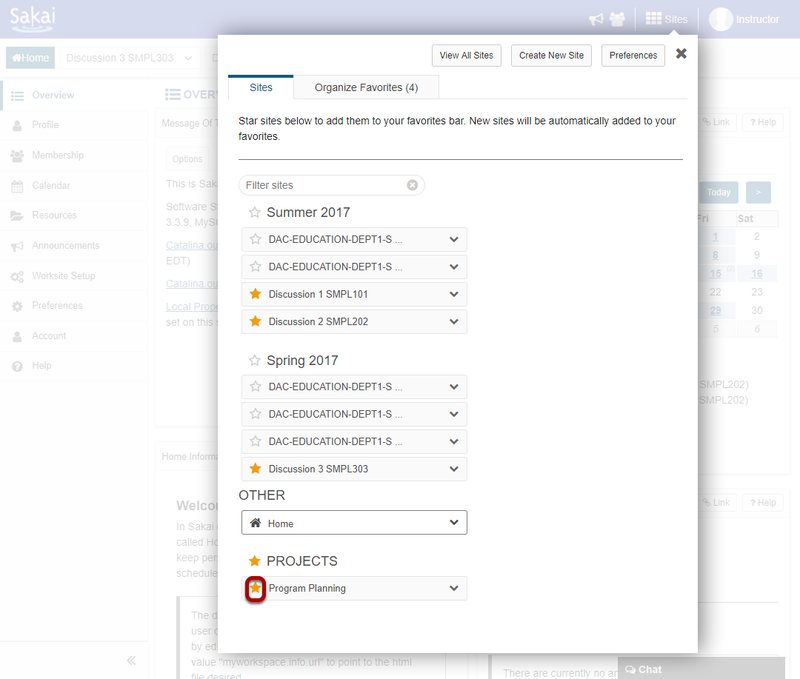 To organize your favorites, go to Sites and select the Organize Favorites tab. Zoom: Drag and drop to reorder. The order in which sites are listed here determines the order in which the buttons appear in the top navigation. Note: The Home button is fixed and always appears in the same location. To remove a site from your favorites, click on the star icon (Remove from favorites) to remove it from the top navigation. You can do this from either the Organize Favorites tab or the Sites tab. Reload to view current selections. Zoom: Reload to view current selections. You will be prompted to Reload if you made any changes to favorite sites or site order. 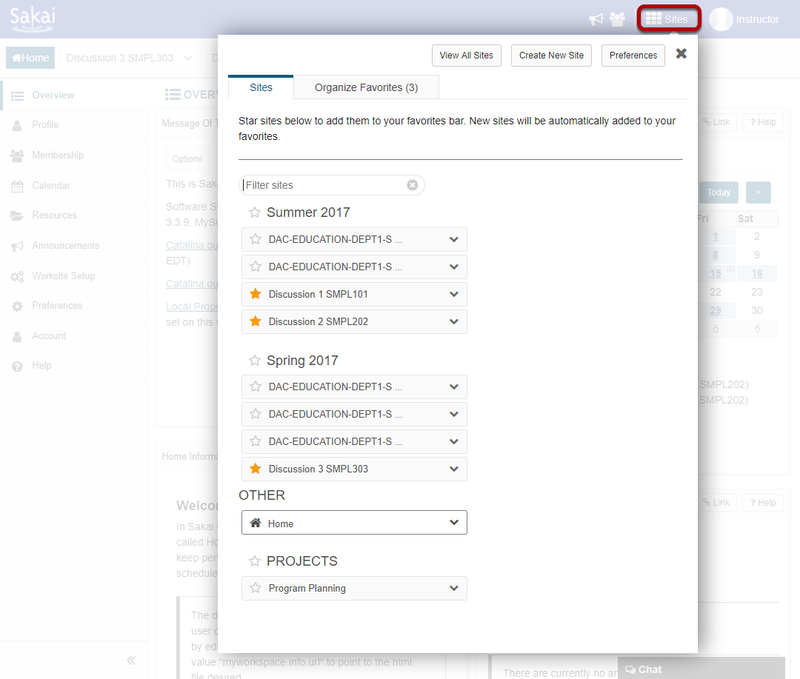 If you would like new sites to be automatically added to your Favorites when you are enrolled, keep the default On selection in the Organize Favorites tab. If you prefer to manually add new sites, select Off instead. Logging out of the system. Zoom: Logging out of the system. You may log out of the system by clicking on the user name and profile photo in the top navigation bar and selecting Log Out from the drop-down menu. Next: What is the Home Tool Menu?